At a young age Bill Crawford learned to defend himself by boxing in his home town of Pueblo, Colorado. As a soldier during World War II his fighting skills were put to the ultimate test. 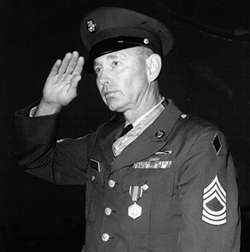 Crawford’s path to the Medal of Honor began in 1943 in Italy. As the company scout, Army Private Crawford discovered three hidden German machine gun nests. Alone and unable to alert his fellow soldiers of the awaiting ambush — with only his rifle and grenades Crawford single handedly destroyed all three enemy emplacements. As his company advanced, he volunteered to stay behind and aid a wounded soldier only to be captured by enemy troops and endured nineteen months in a Nazi prison camp. His youthful golden gloves experience resurfaced when he took on a Nazi guard in a fist fight, – Crawford knocked the Nazi out cold. Back home Crawford’s family had presumed he was killed in action and his Medal of Honor was presented to his father posthumously. After his Army retirement Crawford took a job as a custodian at the Air Force Academy in Colorado Springs and assumed a new role befriending and mentoring young cadets. One former cadet, now an Air Force Colonel authored an essay entitled “A Janitor’s Ten Lessons In Leadership”. It was based on the Medal of Honor recipient and then janitor that had inspired him. Forty years after his heroic action Crawford was presented the Medal of Honor in person by President Ronald Reagan at the 1985 Air Force Academy graduation. Crawford died in 2000 and was buried at the United States Air Force Academy. Click below to view excerpts from the Bill Crawford segment.